Emergence Theory is all about emergent information. Emergent information acts as a force. Information is a non-conserved force. What does that mean? Find out as Klee dips our toes (& legs!) into emergence theory physics. 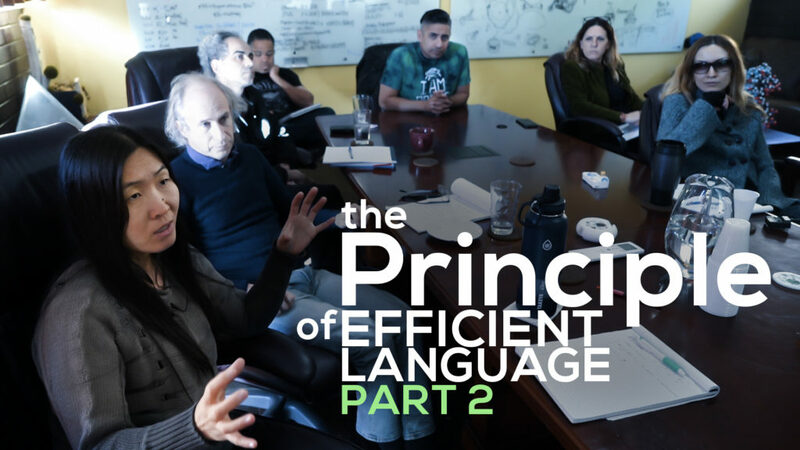 In Quantum Gravity Research‘s (QGR) video ‘The Principle of Efficient Language Part 2’, researcher and QGR founder Klee Irwin discusses a deductive approach to the Code Theoretic Axiom and focuses on a central tenet of the emergence theory model called the Principle of Efficient Language (PEL). Why is PEL important to understand? Because if nature is code theoretic, she would use the most efficient code possible or a member of the set of maximally efficient codes for simulating the physical reality that we know through physics. The code theoretic axiom and PEL provide the rationale for why the universe uses self-referential symbolism, where both the code and the simulation are one and the same object, and where the hardware, software and simulation-output of the quantum neural network are all the same self-referential symbolism – geometric symbols representing themselves. Because quasicrystals have syntactical freedom by mathematical first principles, they are self-referential symbolic languages. Presuming nature to be code-theoretic follows from the deduction that reality is information theoretic. Once we realize from the math, as Mia Hughes recently showed in ‘Quantum Chat 2: A Glimpse Into the Work‘, that energy is information, we have to define information. Quantum Theory generally counts only the base information. Code theoretic quantum mechanics, i.e., emergence theory, on the other hand, deals with the property of emergence, which is a property of all codes/languages. Emergence is part of the very definition of symbolic languages, where letters form words and words form larger networks of meaning and so on. So we can use the same letters as quantum mechanics or classic physics without ever worrying about quantum gravity or the Quasicrystalline Spin Network (QSN) or anything deeper and STILL deduce the code theoretic axiom. In this presentation Klee talks about how we just take fundamental things as letters, either microstates from Boltzmann’s entropy or quantum states from quantum mechanics. One microstate self-organizes with others to form the first primitive complex system and so on. But what both quantum mechanics and classic theory fail to account for is emergence as a force and how powerfully it acts on other objects. When we allow our Boltzmann’s microstates, W, or quantum mechanical analogues to self-organize into the code of DNA or into an entire human being, for example, such systems instruct other particles outside that organization how to behave in a manner that is not describable by the sum of the micro or quantum states. DNA, with its vast code that contains countless instructions, such as protein folding algorithms, possesses far more influence over other matter than a randomly organized collection of the same base information or energy. Consider a DNA molecule and it’s power to instruct bosons and fermions in a spherical volume around it with a diameter of one angstrom. The information pouring out from this code to instruct the self-organization of various simple peptides and other biomolecules is astounding. It is acting like a man in a control tower at an airport orchestrating the behavior of 100 planes in a radius of space far larger than the control tower room. DNA does this with an emergent strata far up on the emergent hierarchy above strata-1 quantum information or strata-1 Boltzmann information. I might say, “It recognizes emergent information to be a force”. Want to know more about the QSN? Like what it actually looks like in 3D. Maybe just sit back now and enjoy Russ and his 3D Printed Quasicrystalline Spin Network, and see how far he took this 3D printing project of a very complex geometric object here: 3D Printing the Hypothetical Substructure of Spacetime!